It’s official — Meg Ryan, 56, and John Mellencamp, 67, are engaged! The couple has been dating on and off since 2011, but sparked engagement rumors back in October 2017 when Ryan was spotted wearing a diamond ring on that finger. Shane Co.’s VP of Merchandise Alicia Davis, who has not examined the ring in person, described it like this, “Meg’s engagement ring looks to have an approximate 1.5-carat round center stone set in a yellow gold swirl band." There was a rumor earlier this year that Meg and John had tied the knot, but Ryan’s rep told EOnline.com it wasn’t true. 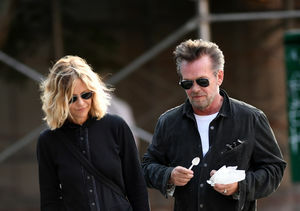 Is Meg Ryan Secretly Engaged to John Mellencamp? Meg was previously married to Dennis Quaid, while John was previously wed to Priscilla Esterline, Victoria Granucci and Elaine Irwin.